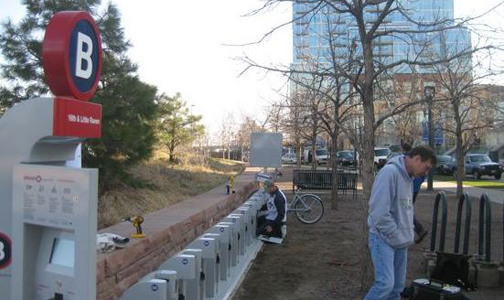 The Denver B-cycle has delayed the 2011 season by two weeks. The 500-bike fleet was going to re-open on March 1st but is now scheduled for Monday, March 14th. Over the winter hiatus they worked on improving the kiosk intelligence and technology to make the system easier to use. Additionally, B-cycle has lowered the age limit for riders to 16 with a driver’s license in hopes to add another demographic to the program. It will help change the way young adults think about transportation and transform their habits. B-cycle also hopes that as the program grows in popularity, officials will be able to keep it open year round. I look forward to seeing the cute red bikes out and around Denver again. The station in Commons Park is a very popular location with the park and bike trails so close.